Login or register to view PDF. Despite the availability of new drugs and devices, the treatment of cardiovascular disease remains suboptimal. Single-pill combination therapy offers a number of potential advantages. It can combine different classes of drugs to increase efficacy while mitigating the risks of treatment-related adverse events, reduce pill burden, lower medical cost, and improve patient adherence. Furthermore, in hypertension, single pill combinations include lower doses of each drug than would be necessary to achieve goals with monotherapy, which may explain their better tolerability compared with higher dose monotherapy. Combination therapy is now established in the treatment of hypertension. In ischaemic heart disease, the concept of a preventative polypill has been studied, but its benefits have not been established conclusively. However, the combination of ivabradine and beta-blockers has proven efficacy in patients with stable angina pectoris. This combination has also demonstrated benefits in patients with chronic heart failure. FI, GR and MV have no conflicts of interest to declare. KN has received honoraria from Adamed, Berlin-Chemie/Menarini, Gedeon-Richter, Krka, Sandoz, Polpharma, Servier, Recordati. KW has received honoraria from Novartis and Servier. Katrina Mountfort of Medical Media Communications (Scientific) Ltd provided medical writing and editing support to the authors. Cardiovascular disease (CVD) is the leading cause of death worldwide and it is predicted that its incidence will increase markedly, particularly in developed countries, despite the introduction of new drugs and devices. One of the factors accounting for the limited effectiveness of pharmacological therapy is poor adherence to treatment, particularly in elderly patients. The use of combinations of multiple agents in a single pill formulation could be of value in improving adherence to treatment and disease control, as well as conferring other favourable actions. In an aging population, patients with CVD will inevitably present with multiple comorbidities requiring a number of different drugs. By choosing drugs with compatible pharmacokinetic properties, the use of single pill combinations can substantially reduce the pill burden for such patients. This article aims to briefly review the practical applications of single pill combinations in three important conditions in the cardiovascular continuum: hypertension, ischaemic heart disease (IHD) and chronic heart failure (CHF). Potential advantages of using a single pill combination therapy as firstline treatment include: a faster reduction of BP and a greater possibility of achieving target BP, opposition to the counterregulatory pathways activated by monotherapies, improving tolerability and decreasing the adverse effects arising from up-titrating single agents. For example, angiotensin II receptor blockers (ARB) such as valsartan can minimise the peripheral oedema caused by a calcium channel blocker such as amlodipine,15 and the combination of perindopril/amlodipine has a reduced incidence of peripheral oedema compared with amlodipine monotherapy.16 In addition, a simplified administration favours a greater therapeutic adherence compared to that expected from frequent therapeutic changes in the attempt to find the most effective drug.10,17 The availability of single pill formulations with different doses of each single drug in the same combination should reduce the problem of changing the dose of a single drug independently from the other. The rationale for a combination therapy relies on utilising drugs with complementary mechanisms of action that lead to a more effective reduction in BP without increasing the risk of side-effects related to increasing the dose of a single drug. The choice of drug must therefore take into account the different mechanisms that sustain the rise in BP. Although various drug combinations have proved to be effective in improving BP control, some trials based on principles of clinical pharmacology have demonstrated that certain combination therapies are more effective than others in reducing cardiovascular risk in addition to decreasing BP. Both the ACCOMPLISH24 and the ASCOT BP lowering arm (ASCOT-BPLA)27 studies have shown that a calcium antagonist/ACE inhibitor combination is more effective than the combinations of ACE inhibitor/diuretic and beta-blocker/diuretic in reducing total and cardiovascular mortality and cardiovascular events. The results of the ACCOMPLISH study appear to be of particular clinical significance as an ACE inhibitor (benazepril) was used both in the arm receiving a calcium antagonist (amlodipine) and in the arm receiving a diuretic (hydrochlorothiazide). The study enrolled more than 11,000 patients with hypertension at high cardiovascular risk and the study was discontinued early after 36 months, when the pre-specified limits were exceeded. At that point, the benazepril/amlodipine therapy group had a relative risk reduction in primary outcome events of 19.6 % compared with the group taking benazapril/hydrochlorothiazide. In summary, increasing evidence indicates that a combination therapy of two different classes of drugs in a single pill is equally or more effective than monotherapy, even in mild-to-moderate hypertension, with an improved tolerability and safety profile. Current European guidelines recommend single pill combinations as firstline treatment for hypertension in patients with a systolic pressure higher than 20 mmHg and/or a diastolic pressure higher than 10 mmHg above the targeted goal, as well as in patients with multiple cardiovascular risk factors such as metabolic syndrome, diabetes, and heart and renal disease.3 Combination therapy is recommended in uncontrolled hypertension and should be prescribed in patients at high risk, because it offers a greater chance of achieving optimal BP control.3 In prescribing a combination therapy, the drugs should have complementary mechanisms of action. Using fixed-dose drug combinations in a single tablet should ensure better adherence to therapy, as a result of a reduction in the number of pills to be taken daily. In turn, better adherence should result in improved BP control and fewer cardiovascular events. Current treatment goals in IHD include delaying atherosclerotic progression by the use of statins and antianginal drugs to improve the imbalance between myocardial oxygen supply and demand. However, as in hypertension, therapeutic goals are rarely attained.38 The National Cholesterol Education Program Adult Treatment Panel 3 guideline recommends aggressive management of patients with concomitant hypertension and dyslipidaemia.39 The European Society of Cardiology (ESC) guidelines for the management of stable coronary artery disease involve an algorithm containing two components: event prevention, typically comprising statins, aspirin, ACE inhibitors or ARBs, and treatment of symptoms, usually involving beta-blockers.40 Therefore single pill combinations are a logical means of simplifying treatment regimes. In addition, a substantial proportion of patients remain symptomatic despite optimal doses of first-line treatment. Combined therapeutic regimens offer a potential way to address this unmet need. As a result of the pill burden, adherence to cardiovascular drugs is low among patients with IHD, even lower than in hypertension. Adherence to concomitant antihypertensive and lipid lowering therapy is particularly poor, with only one in three patients adherent with both medications at 6 months.41 These findings emphasise the likely relevance of using single pill combinations drugs in IHD. 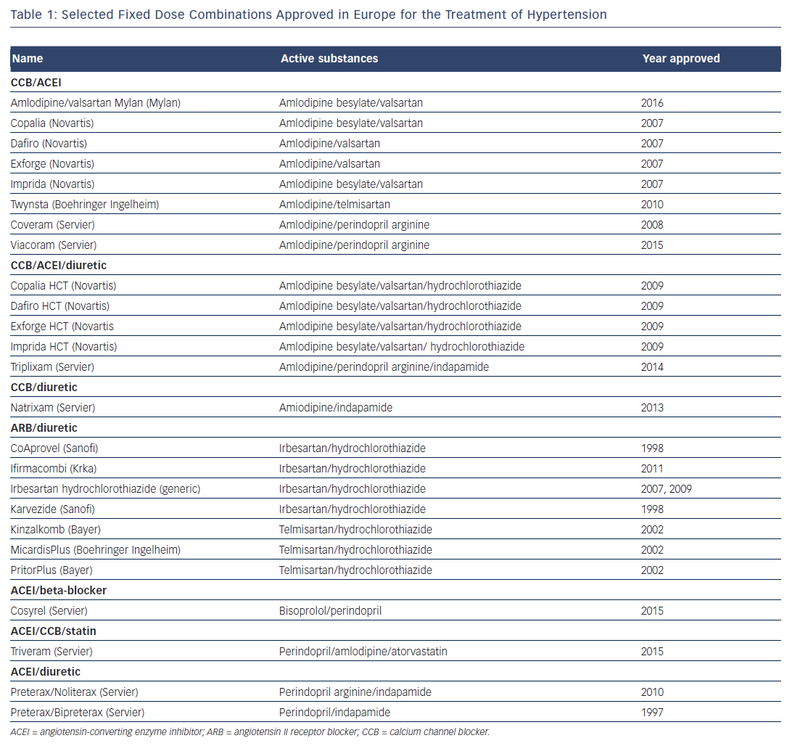 A single pill combination of ivabradine plus metoprolol at different fixed doses (Implicor, Servier) has been approved recently in Europe as substitution therapy (see Table 2),56 and might prove beneficial in terms of adherence to treatment, which could further improve the antianginal effects of this combination therapy. Recent data from a large prospective, multicentre, observational cohort study of 610 patients with chronic stable angina, showed that an ivabradine/metoprolol single pill combination reduced heart rate, angina symptoms and nitrate consumption, as well as improving exercise capacity. Tolerability of the combination was rated as very good in 74 % of cases and good in 25 %.57 A systematic review concluded that the use of single pill combinations increases adherence in the secondary prevention of recurrent cardiovascular events in individuals with established CVD.58 At present, a potential disadvantage for single pill combination therapy in angina patients is the relative lack of dosing flexibility for its individual components. Availability of multiple forms of fixed dose combinations incorporating different dosages will ensure dosing flexibility for its individual components. However, the advantages of single pill combinations, such as beta-blocker/ACE inhibitor or betablocker/ ivabradine, outweigh the limitations and offer substantial benefits in terms of improved efficacy and reduced pill burden. There is growing evidence to support the use of single pill combination drugs in the continuum of CVD from arterial hypertension to ischaemic heart disease and chronic heart failure. There is a need to improve efficacy, acceptability, tolerability and adherence in cardiovascular medicine. Fixed-dose combination formulations offer many of these potential advantages. Furthermore, single pill combinations offer advantages in terms of cost effectiveness, making them an attractive option in low-income countries. However, single pill combinations may also have disadvantages, such as less flexibility in altering doses and differences in the duration of action of the combined drugs. 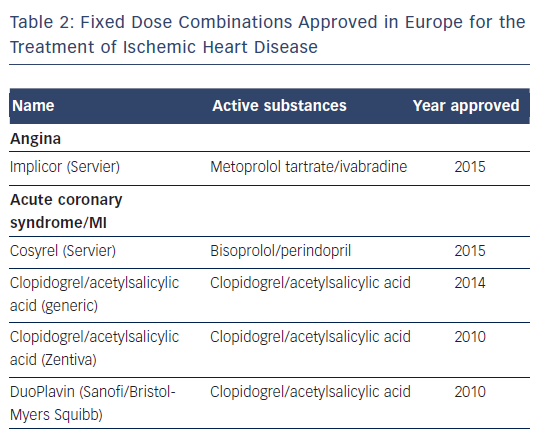 Single pill combinations are recommended by regulatory bodies as first-line treatment in arterial hypertension.3 Current ESC recommendations state that the benefits of combination use may outweigh the risks in a selected group of people with HF for whom other treatments are unsuitable.79 At present, however, there is a lack of single pills for many combinations of drugs. In summary, there is a need for single pill combinations in cardiovascular medicine. However there is a need for further data to establish the long-term safety and efficacy of such combinations. The results of ongoing clinical trials in several countries in primary and secondary CVD settings will evaluate the clinical implications of the routine use of single pill combinations. Ezzati M, Lopez AD, Rodgers A, et al. Selected major risk factors and global and regional burden of disease. Lancet 2002;360:1347–60. Lewington S, Clarke R, Qizilbash N, et al. Age-specific relevance of usual blood pressure to vascular mortality: a meta-analysis of individual data for one million adults in 61 prospective studies. Lancet 2002;360:1903–13. Mancia G, Fagard R, Narkiewicz K, et al. 2013 ESH/ESC guidelines for the management of arterial hypertension: the Task Force for the Management of Arterial Hypertension of the European Society of Hypertension (ESH) and of the European Society of Cardiology (ESC). Eur Heart J 2013;34:2159–219. Egan BM, Zhao Y, Axon RN. US trends in prevalence, awareness, treatment, and control of hypertension, 1988- 2008. JAMA 2010;303:2043–50. Meng XJ, Dong GH, Wang D, et al. Prevalence, awareness, treatment, control, and risk factors associated with hypertension in urban adults from 33 communities of China: the CHPSNE study. J Hypertens 2011;29:1303–10. DOI: ; PMID: . Heeley EL, Peiris DP, Patel AA, et al. Cardiovascular risk perception and evidence–practice gaps in Australian general practice (the AusHEART study). Med J Aust 2010;192:254–9. Chow CK, Teo KK, Rangarajan S, et al. Prevalence, awareness, treatment, and control of hypertension in rural and urban communities in high-, middle-, and low-income countries. JAMA 2013;310:959–68. Gupta P, Patel P, Horne R, et al. How to screen for nonadherence to antihypertensive therapy. Curr Hypertens Rep 2016;18:89. Bangalore S, Kamalakkannan G, Parkar S, et al. Fixeddose combinations improve medication compliance: a meta-analysis. Am J Med 2007;120:713–9. Chrysant SG. Using fixed-dose combination therapies to achieve blood pressure goals. Clin Drug Investig 2008;28:713–34. Gupta AK, Arshad S, Poulter NR. Compliance, safety, and effectiveness of fixed-dose combinations of antihypertensive agents: a meta-analysis. Hypertension 2010;55:399–407. Corrao G, Nicotra F, Parodi A, et al. Cardiovascular protection by initial and subsequent combination of antihypertensive drugs in daily life practice. Hypertension 2011;58:566–72. Wald DS, Law M, Morris JK, et al. Combination therapy versus monotherapy in reducing blood pressure: meta-analysis on 11,000 participants from 42 trials. Am J Med 2009;122:290–300. Waeber B, Ruilope LM. Amlodipine and valsartan as components of a rational and effective fixed-dose combination. Vasc Health Risk Manag 2009;5:165–74. Shirley M, McCormack PL. Perindopril/amlodipine (Prestalia®): a review in hypertension. Am J Cardiovasc Drugs 2015;15:363–70. Corrao G, Parodi A, Zambon A, et al. Reduced discontinuation of antihypertensive treatment by two-drug combination as first step. Evidence from daily life practice. J Hypertens 2010;28:1584–90. Law MR, Wald NJ, Morris JK, Jordan RE. Value of low dose combination treatment with blood pressure lowering drugs: analysis of 354 randomised trials. BMJ 2003;326:1427. Miranda RD, Mion D Jr, Rocha JC, et al. An 18-week, prospective, randomized, double-blind, multicenter study of amlodipine/ramipril combination versus amlodipine monotherapy in the treatment of hypertension: the assessment of combination therapy of amlodipine/ramipril (ATAR) study. Clin Ther 2008;30:1618–28. Feldman RD, Zou GY, Vandervoort MK, et al. A simplified approach to the treatment of uncomplicated hypertension: a cluster randomized, controlled trial. Hypertension 2009;53:646– 53. Neutel JM. Prescribing patterns in hypertension: the emerging role of fixed-dose combinations for attaining BP goals in hypertensive patients. Curr Med Res Opin 2008;24:2389–401. PROGRESS Collaborative Group. Randomised trial of a perindopril-based blood-pressure-lowering regimen among 6,105 individuals with previous stroke or transient ischaemic attack. Lancet 2001;358:1033–41. Messerli FH, Oparil S, Feng Z. Comparison of efficacy and side effects of combination therapy of angiotensin-converting enzyme inhibitor (benazepril) with calcium antagonist (either nifedipine or amlodipine) versus high-dose calcium antagonist monotherapy for systemic hypertension. Am J Cardiol 2000;86:1182–7. Jamerson K, Weber MA, Bakris GL, et al. Benazepril plus amlodipine or hydrochlorothiazide for hypertension in highrisk patients. N Engl J Med 2008;359:2417–28. Beckett NS, Peters R, Fletcher AE, et al. Treatment of hypertension in patients 80 years of age or older. N Engl J Med 2008;358:1887–98. Patel A, MacMahon S, Chalmers J, et al. Effects of a fixed combination of perindopril and indapamide on macrovascular and microvascular outcomes in patients with type 2 diabetes mellitus (the ADVANCE trial): a randomised controlled trial. Lancet 2007;370:829–40. Dahlöf B, Sever PS, Poulter NR, et al. Prevention of cardiovascular events with an antihypertensive regimen of amlodipine adding perindopril as required versus atenolol adding bendroflumethiazide as required, in the Anglo-Scandinavian Cardiac Outcomes Trial-Blood Pressure Lowering Arm (ASCOT-BPLA): a multicentre randomised controlled trial. Lancet 2005;366:895–906. Taddei S. Combination therapy in hypertension: what are the best options according to clinical pharmacology principles and controlled clinical trial evidence? Am J Cardiovasc Drugs 2015;15:185–94. Yusuf S, Teo KK, Pogue J, et al. Telmisartan, ramipril, or both in patients at high risk for vascular events. N Engl J Med 2008;358:1547–59. Parving HH, Brenner BM, McMurray JJ, et al. Cardiorenal end points in a trial of aliskiren for type 2 diabetes. N Engl J Med 2012;367:2204–13. Toth K. Antihypertensive efficacy of triple combination perindopril/indapamide plus amlodipine in high-risk hypertensives: results of the PIANIST study (Perindopril- Indapamide plus AmlodipiNe in high rISk hyperTensive patients). Am J Cardiovasc Drugs 2014;14:137–45. Chow CK, Thakkar J, Bennett A, et al. Quarter-dose quadruple combination therapy for initial treatment of hypertension: placebo-controlled, crossover, randomised trial and systematic review. Lancet 2017;389:1035-42. Gradman AH, Parise H, Lefebvre P, et al. Initial combination therapy reduces the risk of cardiovascular events in hypertensive patients: a matched cohort study. Hypertension 2013;61:309–18. Thomopoulos C, Parati G, Zanchetti A. Effects of blood pressure lowering on outcome incidence in hypertension: 2. Effects at different baseline and achieved blood pressure levels – overview and meta-analyses of randomized trials. J Hypertens 2014;32:2296–304. Johnson ML, Pietz K, Battleman DS, et al. Prevalence of comorbid hypertension and dyslipidemia and associated cardiovascular disease. Am J Manag Care 2004;10:926–32. Petrella RJ, Merikle E. A retrospective analysis of the prevalence and treatment of hypertension and dyslipidemia in Southwestern Ontario, Canada. Clin Ther 2008;30:1145–54. Stamler J, Wentworth D, Neaton JD. Prevalence and prognostic significance of hypercholesterolemia in men with hypertension. Prospective data on the primary screenees of the Multiple Risk Factor Intervention Trial. Am J Med 1986;80:33–9. Chopra I, Kamal KM. Factors associated with therapeutic goal attainment in patients with concomitant hypertension and dyslipidemia. Hosp Pract 2014;42:77–88. Executive Summary of the Third Report of the National Cholesterol Education Program (NCEP) Expert Panel on Detection, Evaluation, and Treatment of High Blood Cholesterol in Adults (Adult Treatment Panel III). JAMA 2001;285:2486–97. Montalescot G, Sechtem U, Achenbach S, et al. 2013 ESC guidelines on the management of stable coronary artery disease: the Task Force on the management of stable coronary artery disease of the European Society of Cardiology. Eur Heart J 2013;34:2949–3003. Chapman RH, Benner JS, Petrilla AA, et al. Predictors of adherence with antihypertensive and lipid-lowering therapy. Arch Intern Med 2005;165:1147–52. Wald NJ, Law MR. A strategy to reduce cardiovascular disease by more than 80%. BMJ 2003;326:1419. Elley CR, Gupta AK, Webster R, et al. The efficacy and tolerability of ‘polypills’: meta-analysis of randomised controlled trials. PLoS One 2012;7:e52145. Thom S, Poulter N, Field J, et al. Effects of a fixed-dose combination strategy on adherence and risk factors in patients with or at high risk of CVD: the UMPIRE randomized clinical trial. JAMA 2013;310:918–29. Selak V, Elley CR, Bullen C, et al. Effect of fixed dose combination treatment on adherence and risk factor control among patients at high risk of cardiovascular disease: randomised controlled trial in primary care. BMJ 2014;348:g3318. de Cates AN, Farr MR, Wright N, et al. Fixed-dose combination therapy for the prevention of cardiovascular disease. Cochrane Database Syst Rev 2014;CD009868. Shafiq A, Arnold SV, Gosch K, et al. Patient and physician discordance in reporting symptoms of angina among stable coronary artery disease patients: Insights from the Angina Prevalence and Provider Evaluation of Angina Relief (APPEAR) study. Am Heart J 2016;175:94–100. Gravely-Witte S, De Gucht V, Heiser W, et al. The impact of angina and cardiac history on health-related quality of life and depression in coronary heart disease patients. Chronic Illn 2007;3:66–76. Heusch G, Skyschally A, Gres P, et al. Improvement of regional myocardial blood flow and function and reduction of infarct size with ivabradine: protection beyond heart rate reduction. Eur Heart J 2008;29:2265–75. Werdan K, Ebelt H, Nuding S, et al. Ivabradine in combination with beta-blocker improves symptoms and quality of life in patients with stable angina pectoris: results from the ADDITIONS study. Clin Res Cardiol 2012;101:365–73. Fox K, Ford I, Steg PG, et al. Relationship between ivabradine treatment and cardiovascular outcomes in patients with stable coronary artery disease and left ventricular systolic dysfunction with limiting angina: a subgroup analysis of the randomized, controlled BEAUTIFUL trial. Eur Heart J 2009;30:2337–45. Werdan K, Perings S, Koster R, et al. Effectiveness of ivabradine treatment in different subpopulations with stable angina in clinical practice: a pooled analysis of observational studies. Cardiology 2016;135:141–50. Werdan K, Ebelt H, Nuding S, et al. Ivabradine in combination with metoprolol improves symptoms and quality of life in patients with stable angina pectoris: a post hoc analysis from the ADDITIONS Trial. Cardiology 2016;133:83–90. Zarifis J, Kallistratos M, Katsivas A. Antianginal efficacy of ivabradine/metoprolol combination in patients with stable angina. Clin Cardiol 2016;39:697–702. Karpov YA, Glezer MG, Vasyuk YA, et al. Ivabradine in combination with beta-blocker is more effective than up-titration of beta-blockers in patients with stable angina. Eur Heart J 2012;13(Suppl 1):777. P4439. EMEA. Implicor 25 mg/5 mg, 50 mg/5 mg, 25 mg/7.5 mg and 50 mg/7.5 mg, film-coated tablets NL/H/3037/001- 004/DC. Available at: http://mri.cts-mrp.eu/download/ NL_H_3037_001_PAR.pdf (accessed 12 April 2017). Divchev D, Stöckl G. Treatment of stable angina with a fixeddose combination of ivabradine and metoprolol: first data from clinical practice. Presented at the 83rd Annual Meeting of the German Cardiac Society, 19–22 April 2017, Mannheim, Germany. Abstract P1694. Banerjee A, Khandelwal S, Nambiar L, et al. Health system barriers and facilitators to medication adherence for the secondary prevention of cardiovascular disease: a systematic review. Open Heart 2016;3:e000438. Mozaffarian D, Benjamin EJ, Go AS, et al. Heart disease and stroke statistics – 2015 update: a report from the American Heart Association. Circulation 2015;131:e29–322. Stewart S, MacIntyre K, Hole DJ, et al. More ‘malignant’ than cancer? Five-year survival following a first admission for heart failure. Eur J Heart Fail 2001;3:315–22. Hauptman PJ. Medication adherence in heart failure. Heart Fail Rev 2008;13:99–106. van der Wal MH, Jaarsma T. Adherence in heart failure in the elderly: problem and possible solutions. Int J Cardiol 2008;125:203–8. Wu JR, Moser DK, De Jong MJ, et al. Defining an evidencebased cutpoint for medication adherence in heart failure. Am Heart J 2009;157:285–91. Fox K, Borer JS, Camm AJ, et al. Resting heart rate in cardiovascular disease. J Am Coll Cardiol 2007;50:823–30. Pocock SJ, Wang D, Pfeffer MA, et al. Predictors of mortality and morbidity in patients with chronic heart failure. Eur Heart J 2006;27:65–75. Kjekshus J, Gullestad L. Heart rate as a therapeutic target in heart failure. Eur Heart J 1999;1:H64–9. Vitale C, Iellamo F, Volterrani M, et al. Heart rate control in an unselected consecutive population of outpatients with stable coronary artery disease: Analysis of the CARDIf Study Cohort. Angiology 2010;61:763–7. Butler J, Arbogast PG, BeLue R, et al. Outpatient adherence to beta-blocker therapy after acute myocardial infarction. J Am Coll Cardiol 2002;40:1589–95. de Groote P, Isnard R, Assyag P, et al. Is the gap between guidelines and clinical practice in heart failure treatment being filled? Insights from the IMPACT RECO survey. Eur J Heart Fail 2007;9:1205–11. Erdmann E. Safety and tolerability of beta-blockers: prejudices and reality. Indian Heart J 2010;62:132–5. Swedberg K, Komajda M, Böhm M, et al. Ivabradine and outcomes in chronic heart failure (SHIFT): a randomised placebo-controlled study. Lancet 2010;376:875–85. Volterrani M, Cice G, Caminiti G, et al. Effect of Carvedilol, Ivabradine or their combination on exercise capacity in patients with Heart Failure (the CARVIVA HF trial). Int J Cardiol 2011;151:218–24. Bocchi EA, Böhm M, Borer JS, et al. Effect of combining ivabradine and beta-blockers: focus on the use of carvedilol in the SHIFT population. Cardiology 2015;131:218–24. Hidalgo FJ, Anguita M, Castillo JC, et al. Effect of early treatment with ivabradine combined with beta-blockers versus beta-blockers alone in patients hospitalised with heart failure and reduced left ventricular ejection fraction (ETHICAHF): A randomised study. Int J Cardiol 2016;217:7-11. Bagriy AE, Schukina EV, Samoilova OV, et al. Addition of ivabradine to beta-blocker improves exercise capacity in systolic heart failure patients in a prospective, open-label study. Adv Ther 2015;32:108–19. Deedwania P. Selective and specific inhibition of If with ivabradine for the treatment of coronary artery disease or heart failure. Drugs 2013;73:1569–86. Pereira-Barretto AC. Cardiac and hemodynamic benefits: mode of action of ivabradine in heart failure. Adv Ther 2015;32:906–19. Swedberg K, Komajda M, Böhm M, et al. Effects on outcomes of heart rate reduction by ivabradine in patients with congestive heart failure: is there an influence of betablocker dose? : findings from the SHIFT (Systolic Heart failure treatment with the I(f) inhibitor ivabradine Trial) study. J Am Coll Cardiol 2012;59:1938–45. Ponikowski P, Voors AA, Anker SD, et al. 2016 ESC Guidelines for the diagnosis and treatment of acute and chronic heart failure: The Task Force for the diagnosis and treatment of acute and chronic heart failure of the European Society of Cardiology (ESC)Developed with the special contribution of the Heart Failure Association (HFA) of the ESC Eur Heart J 2016;37:2129–200.